When it comes to location, amenities and modern comforts, you simply can't beat this 1-bath vacation rental studio condo for 4. Situated by the Park City Base Area at Snowflower Condominiums, you'll have easy access to skiing and the Sundance Film Festival in the winter or hiking and biking in the summer. This unit is about 10 minutes away from Canyon Village and Deer Valley and is near the free shuttle and Downtown Main Street. Enjoy access to the on-site pool, hot tub, fitness center and more! This modern studio unit is perfect for a couple or small family of 4 looking to hit the slopes and make the most of their Park City getaway. 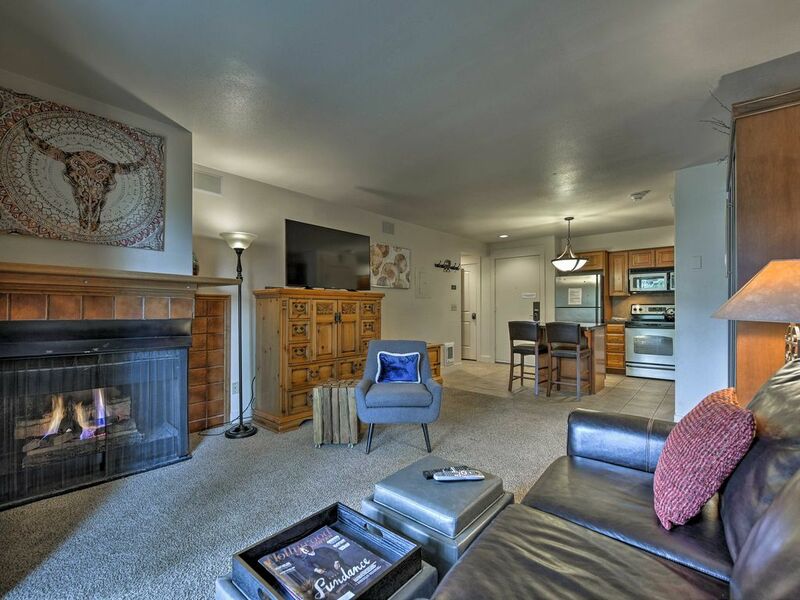 Snow Flower Condominiums is located in the middle of it all, allowing easy access to not only the slopes but to the village and Downtown Park City. Winter or summer, there's no better place to be! Boasting comfortable furnishings, custom finishes and a living space that feels both cozy and intimate, you're sure to feel right at home! Kick back on the sofa or armchair in front of the custom fireplace and tune into a show on the high-definition 4K 50-inch flat-screen Smart TV. The fully equipped kitchen comes complete with ample cabinet space, quartzite countertops, and stainless steel appliances. Serve a home-cooked meal at the custom peninsula counter with seating for 2. This newly-renovated and largely-custom studio condo comes complete with a queen-sized Murphy bed and a queen sleeper sofa featuring individual lighting and USB ports. Tuck the beds away during the day to optimize space. Freshen up in the full bathroom equipped with a shower/tub combo. For your comfort and convenience, a full set of fresh linens and towels are supplied for each guest, along with complimentary toiletries and a hairdryer. The private deck is surrounded by towering and offers plenty of space and overhead cover to enjoy the great outdoors in comfort. Onsite amenities at Snowflower Condominiums include 2 all-season outdoor swimming pools, an all-season outdoor hot tub, underground parking, exercise facilities and more! From this ideally located Park City condo, you can get to the mountain base area by bike, skis or on foot with ease. All-season recreation abounds just minutes away. Get around Park City by car or hop on the free bus system and explore the area. The slopes at both Deer Valley and Canyon Ridge are roughly 10 minutes if you're looking for a new challenge. Park City and Deer Valley are home to not only fantastic slopes and trails but an abundance of celebrations, restaurants, festivals and more. Visit in time for the Sundance Film Festival or the Kimball Arts Festival. You're in for a treat with the area's booming food scene. Order a lox plate or skillet fired dutch baby at the Deer Valley Grocery Cafe, sandwiches at Sammy's Bistro or craft burgers and hand-cut fries at the High West Distillery & Saloon. Great place to stay. Close to everything within walking distance or short bus ride. I would stay there again. Owners are great. Great ski in and ski out location. Nice property. We would stay there again. Excellent location. Ski in and out. Very convenient ski locker room connected to ski slope. Enjoyed staying in this cozy condo. Like to come back next year if I could. Great ski-in/ski-out place in Park City, awesome hot tub! Location is great, definitely ski-in/ski-out with locker to store skis on ground level. Easy to grab a cheap Uber or hop on the free bus to get to Old Town for dinner. Owner was super responsive, proactively reached out to us before our stay and arranged for early check in. Pool and hot tub were really nice - clean and plenty of room. Hot tub could have been a little hotter, but still plenty warm and relaxing after a day of skiing. Overall place was nice, nothing extraordinary, had all amenities needed. The bathroom is carpeted which is a little odd, but shower was decent size and good water pressure. This is a studio condo situated just steps from the Eagle lift and First Time lift, providing easy access to the runs of Park City Mountain Resort (and by gondola to neighboring Canyons Resort). It is also steps from the Blue line bus that runs to the many restaurants, shops, and bars on Main Street. The condo itself isn't large (it is a studio after all), but it was plenty of room for my ski vacation with a friend. What it lacks in high end finishes it makes up for in surprisingly comfortable bedding in the queen beds in the pull out couch and the pull-down-from-the-wall bed. The temperature was always comfortable, the shower had adequate pressure, and a standing fan is supplied for those of us who are used to moving air when sleeping. Kitchen was well equipped for the breakfasts that I made, and there is a coffee maker too. The cable has plenty of channels, and the smart TV allows easy access to Netflix, YouTube, etc. The ski locker in the common area was an extra convenience, and the property's hot tub area is right outside of this building, which was nice in the snow. Although we didn't ever need to contact them, the owners were easily accessible and made sure we had everything we needed. Would definitely stay again!